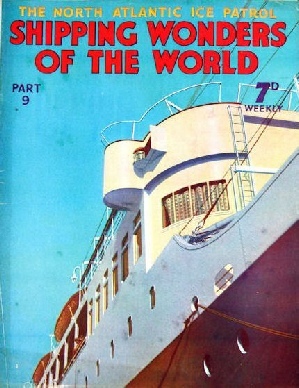 Part 9 of Shipping Wonders of the World was published on Tuesday 7th April 1936. 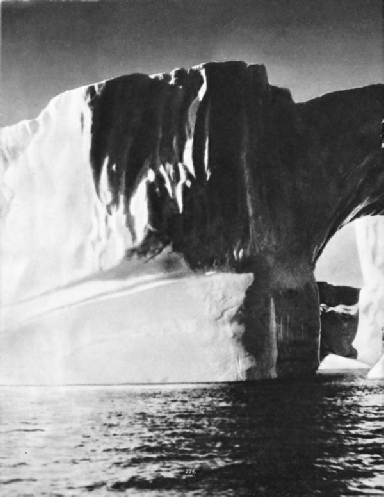 It included a centre photogravure supplement featuring icebergs, which formed part of the article on the North Atlantic Ice Peril. The cover of the present part shows the modern superstructure of the Italian vessel Calitea. Built principally for service between Europe and India and Australia, this 23,428 ton vessel is the latest addition to the famous P. & O. fleet, and a fine tribute to British shipping. The RMS Strathmore is the largest vessel yet built for the P. and O. Company. She was launched last year, and completed in September. The article was written by Boyd Cable and is the fifth in the series The World’s Largest Ships. Shortly after the war of 1914-18 a special fleet of ships was constructed for transporting heavy weights such as railway coaches, barges, lightships and locomotives to all parts of the world. These ships have characteristics not to be found in any other class of vessel. Below is illustrated one of the fleet, the Beljeanne. She is a ship of 414.4 feet length by 67.1 feet beam by 31 feet depth, her deadweight tonnage being 10,170 tons, and her load draught 18 ft 6 in. This is the fifth article in the series on Merchant Ship Types. Click on the small picture to see a British Pathe newsreel clip “A Stupendous Shipment” showing the Beljeanne with a (then) record load of 52 locomotives and coaches bound for India. (1927). 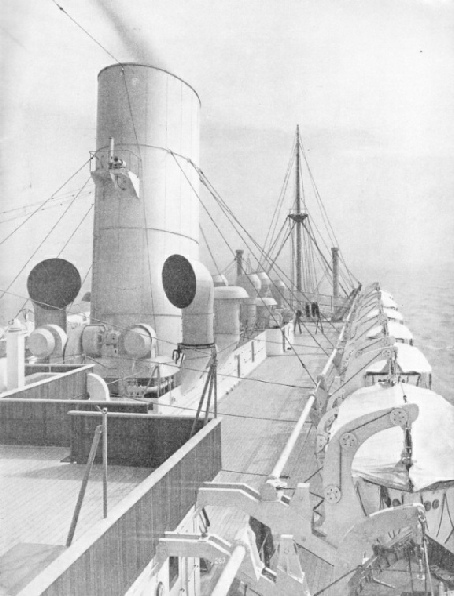 THE TOP DECK of the Strathmore, showing some of the fine modern lifeboats carried by this liner. The twenty-four lifeboats include six “nested” and two power-driven by four-cylinder diesel engines. All boats have 31 feet length, 10 feet beam, and four feet depth. The power-driven boats can take sixty persons and the others eighty-five, giving a total of 1,990, or nearly 400 in excess of a full ship’s company. The boat-lowering gear consists of eighteen sets of gravity davits each driven by an electric motor. Click on the small image to see a British Pathe newsreel clip “Tilbury” showing the Strathmore coming into dock. (1936). 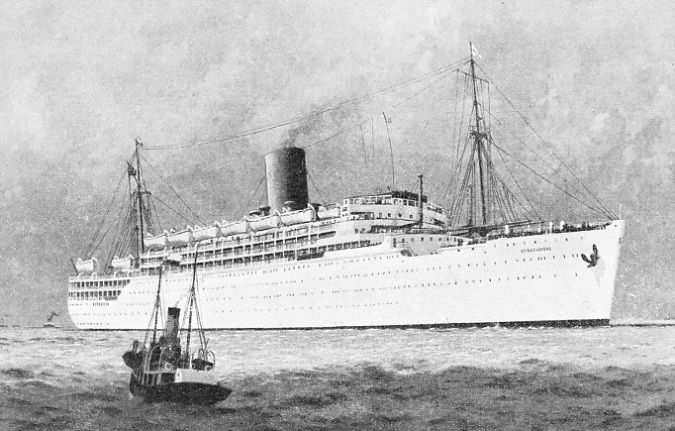 A splendid illustration of the new P. & O. Liner Strathmore. Built by Vickers-Armstrong Ltd, at Barrow-in-Furness, this ship was launched on April 4 1935. Her overall length is 665 feet, breadth 84 feet, and draught 30 feet, and she is of 23,428 tons gross. On her maiden voyage to Bombay, the Strathmore captured the Blue Riband of the passage from Mediterranean ports to India. In the North Atlantic Ocean the International Ice Patrol keeps a vigilant look-out for one of the the mariner’s greatest foes - the iceberg - and earns the gratitude of the shipping world. This patrol, which came into existence shortly after the tragedy of the Titanic in April 1912, is typical of the co-operative spirit of seafarers. Although the patrol is under the command of the US Coast Guard Service, its expenses are defrayed by fourteen nations, Great Britain among them. The article is by Sidney Howard. 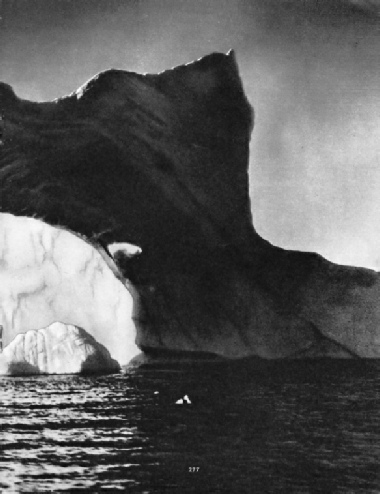 The photogravure supplement shows three icebergs, two of which are illustrated here. A GLISTENING MASS OF ICE. (Left) The iceberg is easily detected by the look-out man of the International Ice Patrol cutter on a fine day. In fog or at night the cold mass chills the atmosphere near and so gives warning of its presence. In rough weather there is also an audible warning, for the sea can be heard breaking upon the berg. 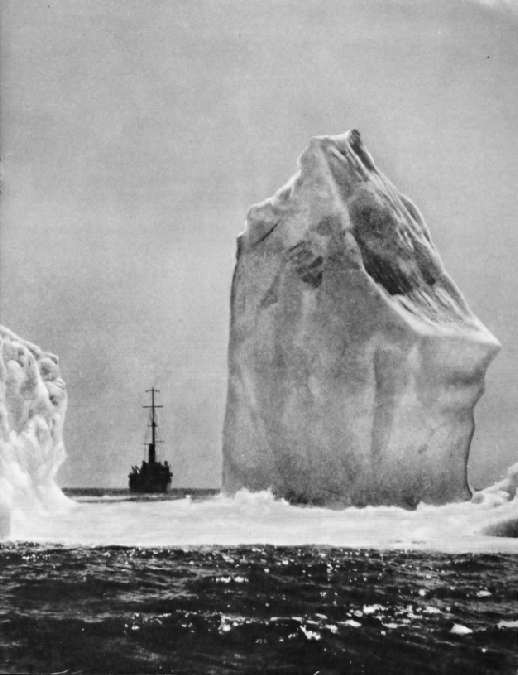 Because of their great size, icebergs are often affected by currents below the surface of the ocean which are running counter to surface currents; and so the drift of a berg, even when once sighted, has to be carefully observed. 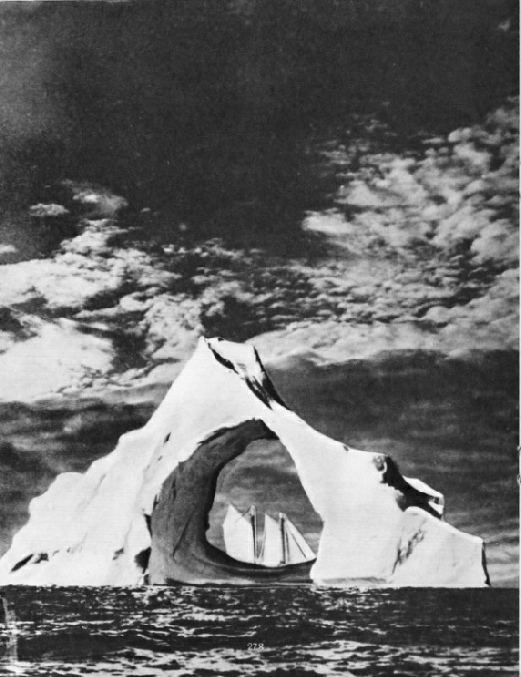 THE VAST PROPORTIONS of the berg (right) may be fairly appreciated by comparing it with the sailing vessel seen close to the opposite side of it. Icebergs are avoided to-day by confining ships to specially charted tracks which vary according to the season. Wireless enables vessels to receive warnings broadcast by the International ice patrol of the position and course of he drifting ice. Building ships’ models is a fine art reaching back to long-past ages - an international art that will never lose its appeal while men love ships and the sea. In this chapter, Lieut-Com. E. Keble Chatterton describes some of the most famous ship models in existence and considers little-known aspects of the fine art of model-making. There is a complementary article on Marine Models in part 35. Click on the small picture to see a British Pathe newsreel clip “Miniature Ships” showing an exhibition of model ships at the Parker Gallery. (1960). The raising of three ships sunk in unusual circumstances provided the salvage experts with difficult problems that were surmounted by many ingenious devices. This part describes the salvage of the troopship Onward at Folkestone, and of the cruiser HMS Gladiator in the Solent. You can read more in chapter XII of David Masters’ book The Wonders of Salvage. This is the third article in the series Dramas of Salvage. It was written by David Masters and is concluded in part 10. GATEWAY OF DANGER. A remarkable berg which had assumed the form of a giant portal photographed in the North Atlantic. Drifting steadily southwards, bergs of this size, whose height may be 150 feet above water and whose weight some thousand million tons, are always gradually melting below the water, until finally the mass becomes top-heavy, overturns and another stage of dissolution begins.